When previous Innkeepers, Robert & Deb Benada, moved here in 2006 they had a dream of restoring the prairie to what had been an active dairy farm for over 100 years. Their call to hospitality extended beyond the B&B guests to the flora and fauna. The Benada’s began in the spring of 2010 preparing the land. A Prairie Nursery consultant evaluated the land and advised us on seeds. Expert nurseryman mixed and planted over sixty forbe and grass seeds. Some of the flowers and grasses we now see include: Smooth Penstemon, Pale Purple Coneflower, Red Milkweed, White False Indigo, Prairie Blazingstar, Yellow Coneflower, Ironweed, New England Aster, Prairie Smoke, Prairie Dropseed, Lavender Hyssop, Leadplant, Butterflyweed, Coreopsis, White Prairie Clover, Tall Blue Larkspur, Rough Blazingstar, Cupplant, Lupine, Dotted Mint, Big and Little Blue Stem, Indiangrass, Side Oats Grama, Wild Bleeding Heart, Turtlehead, Marshmerigold, Compassplant, Lobelia, Wild Geranium, Menarda, Mayflower, Columbine. We’ve had seven birdhouses to attract bluebirds over the last six years. More than fifty bluebird chicks have fledged along with at least as many tree swallows and some chickadees since we put them up with the help of Dr. Kent Hall of the Bluebird Restoration Association of Wisconsin. In 1980 only 22 Bluebirds were observed in the entire state of Wisconsin. The DNR noted the 90% population drop over 50 years. Bluebird Restoration Association of Wisconsin was formed and leaped into action building and distributing birdhouses, researching and educating. Every week from April to September, Robert monitors our “Bluebird Trail” along with twenty one bird houses at Hartman Creek State Park. Thanks to our Association, Wisconsin now leads all states in producing Bluebirds from artificial nesting boxes. In 2012 there were a record total of 35,592 recorded fledglings. These pea-like flowers open under the weight of an insect, revealing a horned-shaped stamen that deposits pollen on its visitor. This is the only host plant for the Karner Blue butterfly caterpillar, an endangered species in Wisconsin. The largest turtle in Wisconsin can weigh up to 50 pounds.Females may travel large distances to find a good area to lay eggs.We had one laying eggs in the garden in front of our house and seen tiny babies waddling to the river. The Monarch Butterflies’ life cycle from egg to caterpillar to chrysalis (in the entryway to our inn) to butterfly depend on milkweed. We have Common Milkweed and Swamp milkweed on our land. Monarchs migrate north into Wisconsin in May. Wisconsin has several generations, with the last generation migrating to Mexico in September. 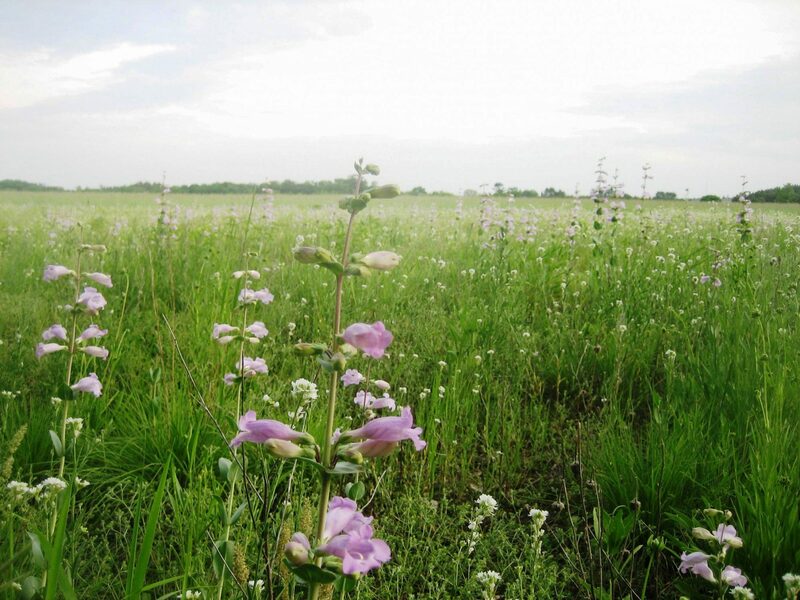 Today, the Cappelle family, maintains the prairie for all to enjoy. 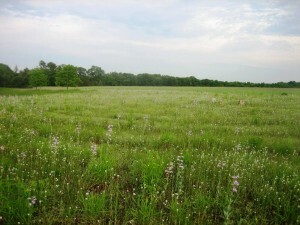 You’ll find a variety of wildflowers, tall prairie grass and an abundance of animals attracted to the native prairie.